All the talk from Sunday Night Baseball focused on the Yankees rookie outfield sensation Aaron Judge. When Judge came up to bat in the eighth inning, the Yankees were down three with one man on. Judge proceeded to lace a ball that sounded like it was headed towards the moon. "I didn't think it was going in the bullpen. I thought it was going to hit the jumbotron, to be honest," said David Price. "That's the loudest ball I've heard." 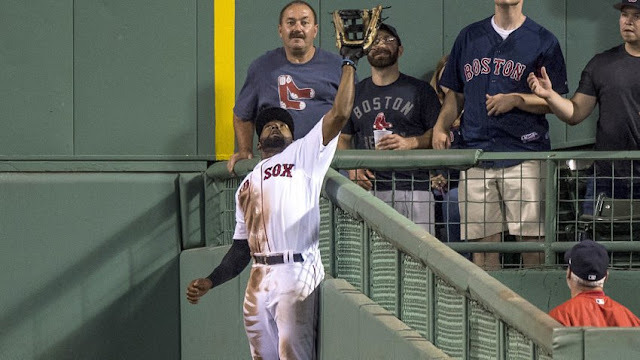 Instead of the jumbotron, the ball traveled deep into the Red Sox centerfield triangle, where Jackie Bradley Jr. made a jaw-dropping catch leaping over the wall. 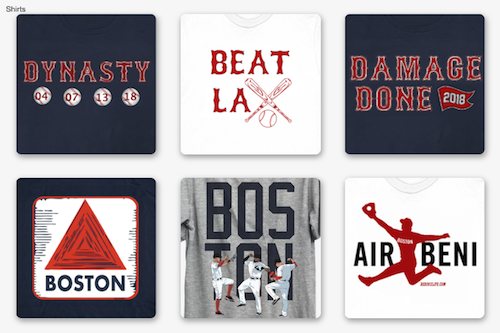 The amazing catch kept the Red Sox up three, and secured a dominant eight inning shutout performance from David Price. 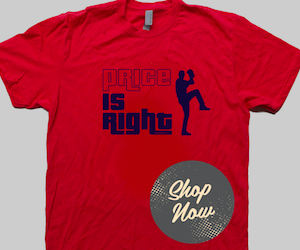 "I'm pretty sure the wind was blowing in tonight," Price said. "That's the only reason why that ball stayed in, other than Jackie. That was special." Judge's blast was calculated with a 107.5 mph exit velocity and a 32 degree launch angle. The ball had a 94 percent hit probability and is a home run nine time out of ten, according to Statcast. "It's one of those balls you just try to time up in the air," said Bradley. "Those are the type of plays, they rarely happen. A lot of different things got to go the right way. Gotta be just far enough over the wall, but short enough where you can grab it. And you've got to be able to get back there in time." For Judge, he believed he had his 31st home run of the season. However he showed his respect for Jackie after the game on twitter. "I thought it had a chance, but I just hit it to the wrong part of the park and the wrong center fielder," said Judge. "Jackie has been making plays like that for a long time." One of the biggest reasons for Jackie's catch was his starting position. Out of all the hitters in the league, Judge requires centerfielders to start the furthest away from home at 330 feet. Bradley usually starts 320 feet from home, but when Judge stepped up, he moved back nearly 16 feet. "You know, Jackie's got such good anticipation, and his reads and his routes are as good as you're going to find at the big league level," said Red Sox manager John Farrell. "Fact is, a lot of Judge's power is to that part of the field. So in a lot of cases, power guys, we're going to try to maybe cover the territory, so you might shift a little bit more to right-center field to be able to cover the triangle and then as much as Mookie [Betts] has to cover in right. But he got right to the spot and was able to jump and time it just perfect." And Bradley was quite aware of who was up in what the situation was. "He can go any way," Bradley said of Judge. "He's proven that countless times. He's a big, strong man, and you can't take anything for granted. If he gets the bat on the ball, it has a chance any time." Along with keeping David Price's shutout alive, the catch allowed the Red Sox to split the four game series and stay 3.5 games ahead of the Yankees in the AL East. "It was great," said Betts. "It actually made the hair stand up on my arms. It was electric. It was just a fun moment to be a part of."